Hi-Grade is a UK-based manufacturer that uses generic components to offer good value for money. The Notino D8000W an upgraded version of the Notino D8000 we reviewed a while back, featuring a high-end Intel Core 2 Duo processor and dedicated graphics. The 2.53GHz processor provides impressive office performance, with the Windows 7 operating system running quickly and smoothly. The 2048MB of memory included as standard lets this machine down slightly, however. It's less than you'll find on the other machines at this price, holding the D8000W back when it comes to multi-tasking. The 15.6-inch screen features good colour reproduction with vibrant images on offer from the glossy Super-TFT coating. It's not the brightest screen ever, which can hinder usability in direct sunlight. The 1366 x 768-pixel resolution is standard for a machine of this size, resulting in reasonably crisp images. 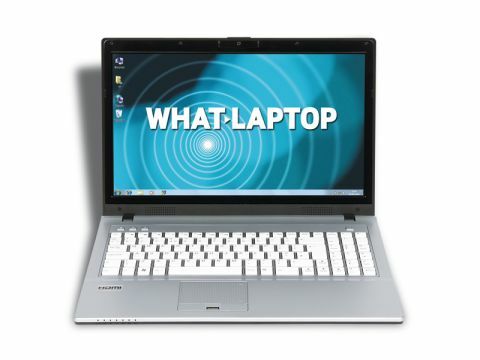 Graphics are handled by an entry-level dedicated Nvidia G105M GPU, with enough power to run multimedia tasks with ease. You won't be able to play the latest games, but older titles will run without issue. High-definition videos also run smoothly. Along with the Sony VAIO VPC-CW1S1E/R, this laptop features an isolated-style keyboard, with the keys sticking out of individual holes cut out in the chassis. A benefit of this is that the keys are spaced further apart, making it easier to type at speed. It's a comfortable and responsive keyboard with a numeric keypad placed alongside, but it's also one of the noisiest keyboards we've used for a long time. Although the design could be a little more interesting, it's still a neat and tidy laptop with the matt finish to the lid proving tactile and looking good. The overall quality of the chassis is very good, especially around the lid, offering plenty of protection for the display. The 320GB hard drive offers plenty of storage space and it's easy to access and back up data to most popular memory card formats, thanks to the 3-in-1 flash memory card reader. Networking features are good, with Gigabit Ethernet offering the fastest fixed connection speeds currently possible and 802.11a/g Wi-Fi providing wireless access. Unlike some of its rivals, Bluetooth isn't included as standard. Three USB ports make it easy to connect peripherals and both VGA and HDMI ports are also in place. Overall, Hi-Grade's Notino D8000W is a competent machine, only let down by its noisy keyboard and poor battery life. That said, it's unfortunately difficult to recommend this laptop over some of its excellent rivals.